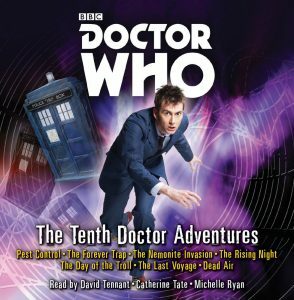 Back in 2008 and 2009 seven exclusive audiobooks were released featuring the Tenth Doctor and Donna Noble and were read by the actors who played the characters, David Tennant and Catherine Tate along with would be companion Michelle Ryan of Planet of the Dead fame. Now released in a lavish box set all seven stories are together at last, giving Doctor Who fandom the chance to enjoy these corking adventures all over again. This collection of tales is fantastic from start to finish, beginning with Pest Control, by Peter Angheldes and read by Doctor Ten himself, we find a world in conflict as a group of Centaur like creatures called the Aquabi and an army of humans are engaged in a bloody battle, and conflict that Doctor and Donna must find a way to end as a far more dangerous threat comes to light. Next up is The Forever Trap by Dan Abnett, read by Catherine Tate. Starting off in somewhat similar territory to The Greatest Show in the Galaxy, a holographic marketing scam invades the TARDIS and the Doctor and Donna find themselves trapped within the Edifice as beings from all over the universe roam this strange new environment. The Nemonite Invasion by David Roden and read by Catherine Tate takes place during World War Two in the war tunnels beneath Dover and it’s a great base under siege story as the Royal Navy and the TARDIS crew struggle to fend off the parasitic Nemonites. Following on from this the Doctor flies solo in the The Rising Night by Scott Handcock. The Rising Night places the Doctor in 18th Century Yorkshire where he has to deal with country bumpkins, eternal night, malevolent aliens and a horse called Henry. The Day of the Troll by Simon Messingham sees the Doctor on Earth in the far future where famine is running rife and England is a barren wasteland. The Last Voyage by Dan Abnett, and read by David Tennant, is a story of a pioneering spacecraft on its way to a distant planet, but somewhere along the way the crew mysteriously vanish. Can the Doctor find out what has happened? The box set finishes off with Dead Air by James Goss, which is read once more by David Tennant. In this story the Doctor finds himself aboard a pirate radio ship in 1966 battling the Hush which is intent on destroying the world!